Local children are learning about suburban hunger and taking action to raise donations for emergency food programs. 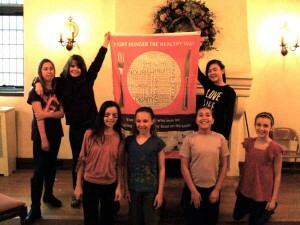 Leaders of Girl Scout Troop 20528 in Montclair said the goals of the Campaign to Fight Hunger the Healthy Way — to help community members of all ages to eat well — resonated deeply. The Cadettes had recently finished a healthy eating project and had learned about local homelessness through a scout program. Inspired by the campaign toolkit, the middle school girls set up a stand at the A&P on Valley Road in Montclair in December, hung the campaign banner, and handed out forms that listed specific items needed by food pantries. Just an hour and a half later, the girls headed over to Toni’s Kitchen with more than 20 bags of healthy groceries. “The kids were really thrilled. It was beyond anything they had expected,” said Lukachko.